OMG, it’s freakin hot in Toronto. I love it. But it’s making me sluggish so my cooking efforts have been very minimal… Salads and grilled meat are my bread and butter. Even if you don’t normally like Tuna unless it’s rolled up in rice and seaweed, you will like this. I promise. Especially because you can use guacamole to dip it in…..guac makes everything better. 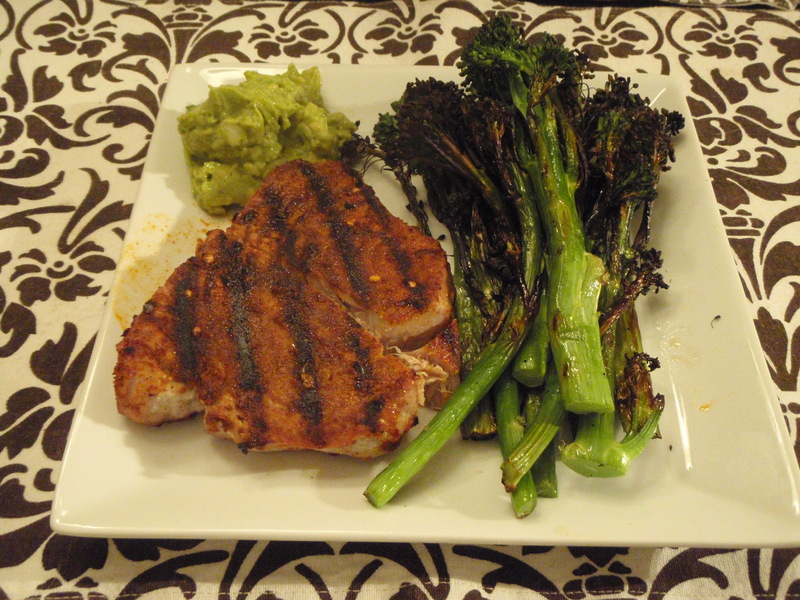 The gauc is highly recommended in this recipe because the tuna is spicy and the cool guac evens out the taste. This recipe takes 5 minutes to prep and then goes on the grill for just a few minutes. I served it with a side of grilled brocolini. Rub the spice mix all over the steaks. Throw on the grill (med-high heat) for about 3 min / side. If you prefer it more rare in the middle (which is how it’s supposed to be served), don’t leave it any longer. Depending on how thick your steaks are, you may not need 3 min/side. Serve with a generous dollop of guacamole. Fully-Primal Husband provided the following testimonial, “The rub is really good. Good flavour. Good crust. I think i may have over-cooked it a bit….next time it should be more rare in the middle.” Fully Primal Husband is the master of the grill. Looks good. I have some tuna steaks (way cheaper than salmon) that I haven’t been able to figure out what to do with. @jenn – I got it at loblaws. I ‘ve had their tuna steaks many times before and im still alive! I think Avenue Road Seafood is gone now…unless they moved? The location on Avenue is still there! ohhhhh……i’m thinking of the place on Eglinton at Avenue Road that was beside the Healthy Butcher. My bad! I’ll have to check out that spot! PS: Pusateri’s on Avenue had good looking tuna steaks….I would just verify that they’re wild because i’m not sure it said. I made this up last night, my husband grilled them and they were wonderful!!!! Thank you for the recipes!